Virtuosically performed Romanian Spectralist music transports audience to a shifted aesthetic world. In general, the composers presented in the wonderful Composer Portraits series at Columbia University’s Miller Theatre are well-known leaders in contemporary music in a wide variety of genres: the value of the series lies in the opportunities that the overlapping music-playing and music-listening communities of New York City have for immersion in individual composers’ unique purposes, achievements and points of view. But something quite different was at work in the recent Iancu Dumitrescu Composer Portrait. 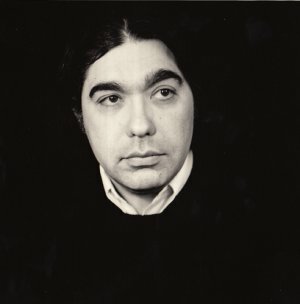 Taking his inspirations for music-creation from an isolated Romania of the past, Dumitrescu has projected the ancient into the contemporary in entirely original ways: his music isn’t like anyone else’s. It’s as though the Enlightenment didn’t happen in the ancestry of Dumitrescu’s music: this particular sound-art – this Orphism – seems to have moved at its own pace from the ancient and medieval, from a myth folk-idiom of divergent Middle European and Eastern Asian elements, and from a reverence for music as a form of sacrament straight through to modern technology and electronics, speculations that metaphor might be the best way to describe reality, and twenty-first century astrophysics. ‘Spectral’ is an adequate initial descriptor of Dumitrescu’s music: it’s other-worldly and evocative. At its very core lie densely nuanced explorations of liminality. Traditional Western European orchestra instruments are played both traditionally and experimentally; electronic sounds of various sorts – all rendered musical – function alternately as contexts or echoes, foreshadowings or recollections. At times, extended passages are like sound vistas of symphonies from other galaxies, created with neither cliché nor sarcasm. In his mid-concert discussion – (these conversations with composers are a standard and always rewarding feature of the Miller Theatre Composer Portraits series) – Dumitrescu focused on the acousmatic aspects of his music, on its alchemy and mysteriousness. Classical music, he noted, is “theoretical,” whereas his is “natural.” But Dumitrescu’s natural music is also full of secrets: Orpheus’ sound-alchemies, vibrating as they do both far out in the cosmos and deep down in individual human souls, are at once luminous and mystifying. Playing the six works on the program were the thirteen musicians of Either/Or, conducted by co-founder Richard Carrick. This ensemble can manage both chamber-music intimacy and symphonic bigness; they can shimmer in delicacy; they can shake the ground like earth-quakes. 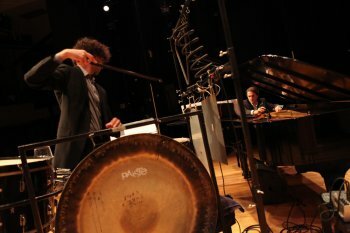 Carrick conducted Dumitrescu’s works as though the entire ensemble were a single huge theremin extended over the whole stage: he moved his arms and body with dancerly invocation and sacerdotal command. The individual works on the program, all described as premieres, though originally conceived between 1991 and 2014, ranged in length from nine to twenty-one minutes. Their titles – Black Holes’ Collision, Hyperspectres IV, Galaxy (V), Pierres Sacrees (II), Cosmic Pulse (II) and Unstable Molecules – reveal a key feature of Dumitrescu’s sensibility and purpose: entry into his music is entry into another place. Microcosm and macrocosm are interchangeable, and they both challenge human certainties about location and context. This is heady stuff. This is fascinating, often gorgeous music, alternately ethereal and earthy, delicate and visceral. At one level, its call is satisfyingly seductive: give in, be transported. At another level, the very same call – give in, be transported – requires courage. It’s a rare creative accomplishment that sweet pleasure and cosmic dauntlessness can so merged in a single art form as they are in Dumitrescu’s music. Three fascinating interconnected American premieres by prominent Swedish-Dutch composer played by the very best of contemporary classical musicians. Now retired at the age of 95, this distinguished man of the theater has been a stage manager for The Lunts, a director, an acting teacher and an author.